Paradigm Zenith: Suave residential spaces surrounded by premium luxury for a well-endowed lifestyle! Thane is a beautiful city that offers a good balance between manmade creations and a beauty of nature. A part of the Mumbai Metropolitan Region (MMR), Thane has turned into one of the most popular cities in the country. Purchasing Property in Thane is a better option to get away from the high property prices in Mumbai. The real estate market in thane has up-scaled over years in terms of residential as well as commercial projects.Neighbouring Mumbai, Thane offers easy connectivity to a number of locations and makes commuting simple and convenient. With a number of wide roads, highways and public transportation, individuals can reach locations without any hassles. Although Thane contains a number of developments, this city offers greenery in plenty. Residential development are well-spaced from each other and the availability of land gives real estate companies an opportunities to construct bigger development without any compromise on space. When it comes to physical and social infrastructure, Thane offers the best of the best! Places like schools, colleges, malls, shopping centres, multiplexes, hospitals, medical centres, cafes, restaurants, lounges, pubs, clubs, banks, ATMs and a lot more are just a hop, skip and jump away! Be it a weekend or a weekday for that matter, there is always something to explore and something new to do when residing in Thane. Without a doubt, residing in Thane gives you the best of both worlds, Thane & Mumbai City! For all that it has to offer, home buyers as well as investors are purchasing property in Thane these days. As the property prices are rising at a steady rate, now is a good time to make a goof purchase. There are many options available, but choosing the right development is ideal for a modern-day lifestyle and high-end returns. 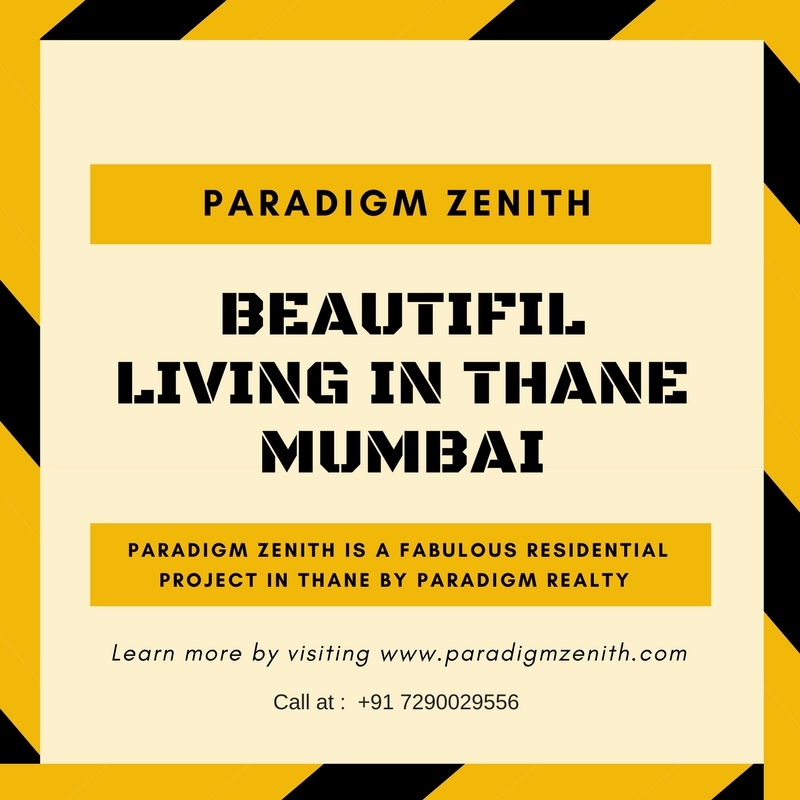 Paradigm Zenith is a fabulous residential project in Thane by Paradigm Realty that offers high-end luxury and comfort for a well-endowed lifestyle. This residential development extends over vast acres and offers vibrant variants of 1BHK and 2BHK luxury apartments with carpet areas starting at 497 sq. ft. and going up to 740 sq. ft. Experience the beauty of luxury space that will surely make you glad! This development speak luxury from head to toe and offers world-class internal and external amenities of pure delight. You will find apartments that contain high-end fittings, wide balconies and windows providing landscape views, elegant kitchens with multiple provisions, safety features and so much more. The external amenities at this development will also keep you coming back for more! They include a clubhouse, sports facilities, pay-area for kids, swimming pool, gymnasium, jogging track, meditation centre, multipurpose hall, power back-up, car parking facility, landscape garden and top-notch security. Without a doubt, this development has something you and every member of your family to enjoy and have a good time! Starting at a price of Rs.51.99 lakhs and moving up to Rs.77.18 lakhs, the apartments at this development are affordable and definitely worth a buy. Choose from different payment plans along with home loan facilities through associated banks, NRI services, customer service and more for a hassle-free buy and a fabulous life in Thane.